In a large bowl combine ingredients. Press granola into the bottom of oiled baking sheet and bake for 15 minutes. Stir and bake another 10 minutes. Cool completely in the pan without stirring. Granola will crisp up and clump as it cools. Store in an airtight container. A few things to remember when making granola. Don't get stuck following the recipe exactly as is! Make it your own. Add chocolate chunks after it cools if you want more chocolate! If adding dried fruit to your granolas don't add them right away - it will burn. Some nuts will burn also. You may want to add halfway through baking or at the end. More honey usually makes for chunkier granola- and if you want bigger chunks don't stir while baking, let it cool first then break it up. These curated dinners are one of my favorite things to construct. Most often they include recipes found from books, blogs, stories of culture and food... The links and credits are always right below the photos for you to click on- I hope you will discover some favorite new folks to follow and new food and drink to cook up and enjoy with the people you love! Every Monday you will find a new menu here- giving you plenty of time to plan ahead for your weekend gathering. If you don't have time to create every course share this post with a group of friends and have each guest be responsible for 1 course. It is a great way to enjoy delicious meals without having the stress of creating everything being served. Whisk the red wine vinegar with 1/4 cup olive oil in a large bowl and season generously with salt and pepper. Add the radicchio and arugula and toss to coat them nicely. Taste and adjust the seasoning. 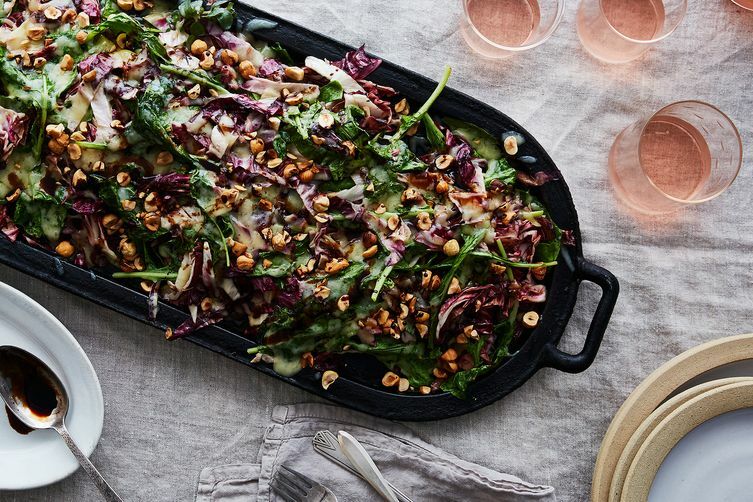 Pile the salad on ovenproof plates or an ovenproof platter and top with the cheese. Broil the salad just until the cheese is melted, about 1 minute. Sprinkle the toasted hazelnuts on top and finish with a drizzle of saba. Serve right away. and use lemon rather than lime. In a large skillet over medium heat, melt the butter and cook until it turns brown and smells nutty, about 4 to 6 minutes. Stir frequently, scraping up any bits from the bottom so they don't burn. Add the fish sauce, chile-garlic sauce, and lime zest to the brown butter, stirring to integrate. The fish sauce will smell strong at this point, but it’ll mellow as the dish comes together. Meanwhile, cook the soba noodles according to package directions. When the soba noodles are done, drain and immediately add them to the skillet. Add 1 teaspoon sesame oil and 1 tablespoon of lime juice, and toss together until the noodles are evenly coated with the brown butter sauce. Taste for seasoning and balance, adding kosher salt, more lime juice, or sesame oil if needed. Serving 6? Double this recipe and either pour into individual ramekins or use a 8 or 10 inch cake pan. A light and super moist cake made with fresh ricotta and lemon. Preheat the oven to 400°F. Grease a 6" cake pan with some softened butter. In a large bowl, mix the butter and sugar together using a rubber spatula. When the two are combined and creamy, add in the egg and mix to combine. Pour in the flour, baking powder, and salt. Stir everything together. Then add in the ricotta, lemon zest, and grated apple. Again, stir everything to combine - there should be no visible clumps of flour or dry ingredients. Scrape the batter into the prepared cake pan and smooth out the batter. Bake the cake for approximately 25 minutes, until the cake is beginning to golden on top and the edges start to pull away from the sides of the pan. Let the cake cool in the pan for 15 minutes before flipping out onto a wire rack to cool completely. Dust the top with powdered sugar. Plum Cake, Plum Torte, the Zwetschge Kuchen. Such a simple recipe to celebrate the harvest. These beautiful deep purple ellipses which bring me back to my grandma and afternoons the first few weeks back to school. She always baked this plum kuchen. The German plum harvest is celebrated every year with a festival in Bühl in the southwestern part of the country. In this simple German dessert, cake batter is covered with wedges of fall plums; a sprinkling of cinnamon sugar. Grandma always took time for kaffe & kuchen which is a lovely tradition in Germany. Our children love the idea of dessert before dinner and have fond memories from our visit to Germany. Sitting around a table filled with fresh baked deliciousness being passed around and enjoyed by family and friends joined in conversation. Coffee passed around, one two spoons of sugar, sweetly set table of plates and cups probably older than the oldest adult. There was a language barrier, some nervousness in customs not understood, differences in our routine- but somehow the time and ❤ put into the sweets on the table and the gathering around made that all fade away. How can you not relax and be grateful for everything when there is a tableful of cake spread out before you. And you know the next day it will happen again. Nobody telling you to eat just one. So this Plum Kuchen is made and eaten in gratitude for grandma, the importance of gathering around the table and making things from scratch. It needn't be complicated, daunting, difficult. Take time to honor the simple pleasures life grants us. Bake a cake! Add flour, baking powder, salt and combine. Pour/smooth into a 8, 9, or 10 inch buttered springform pan. Press plum halves in batter. Squeeze fresh lemon over top. Sprinkle with sugar and cinnamon. Bake until toothpick comes out clean. Probably just under an hour. Enjoy that incredible scent from you oven! 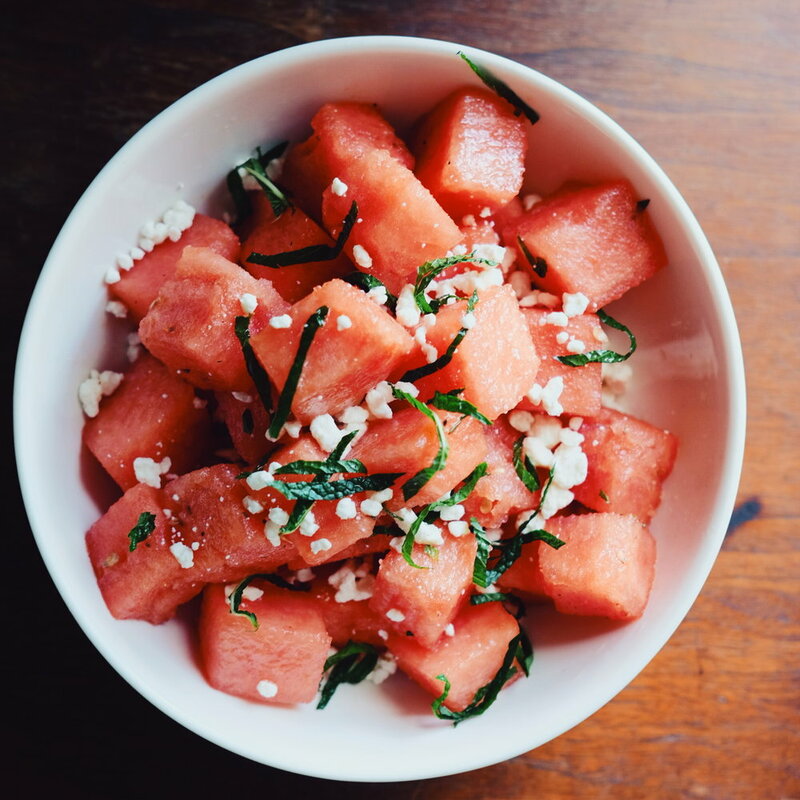 Watermelon, Mint, and Feta salad. Ah, the melons are holding on and the mint has taken over. Enjoy it! 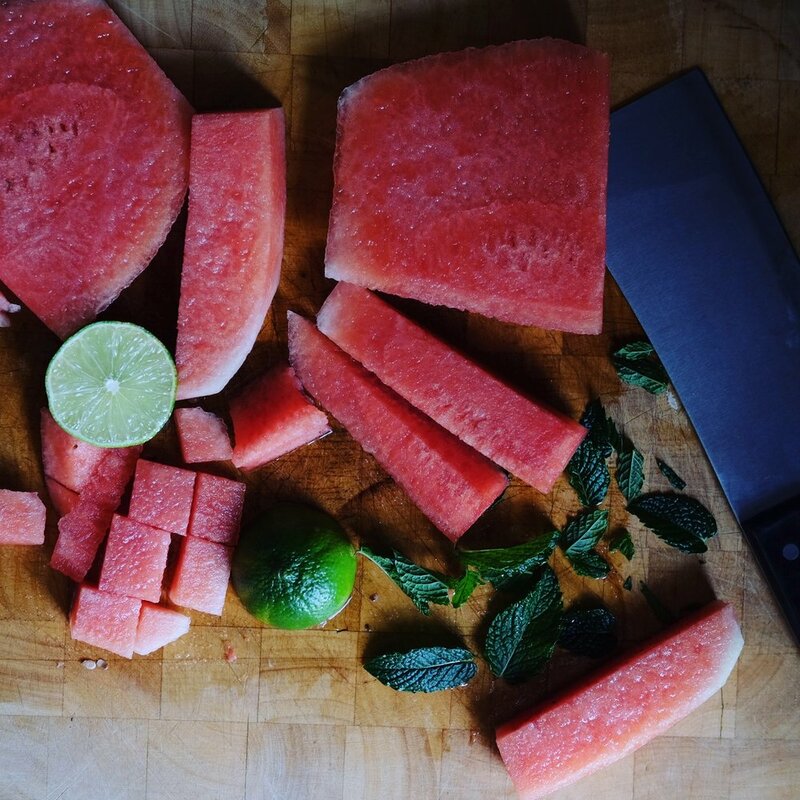 4 cups of cubed watermelon. Oh August, I must be honest. I never really loved you. September though, she has hold of my heart. The heavy load of end of summer harvest, sweeter than ever. The Chilly mornings and crisp breeze waiting to steal those leaves away, with the green, the flowers. A reason to cover up, to add another layer, to start a fire... Hello September. How I have missed you. Such a perfect month to find some new recipes, to blend together summer and autumn goodness. Cool refreshing balancing the warm and nurturing. Early September brings us the heady scent of vines heavy with the deep purple Concord grapes. Butternut squash, broccoli, cauliflower, are all ripening. Peaches are at there last sweet days. Rosemary is feeling necessary, sage is on it's way. And fresh basil, by now I am just about getting close to letting her go. This is my Supper Club concert of lovely flavors to celebrate the first week of September. I hope that you take some time to visit these gorgeous blogs and bookmark them. Gather some friends, share the recipes, and get cooking! When everyone adds something to the table the time spent together is magical ~ enjoy! Just click on the title of each dish and you will be taken to the recipe! easy peasy, lemon squeezy. Bacon wrapped grilled peaches with balsamic glaze. I would substitute Sage for the Basil if the weather is chilly. Oh Lilacs. 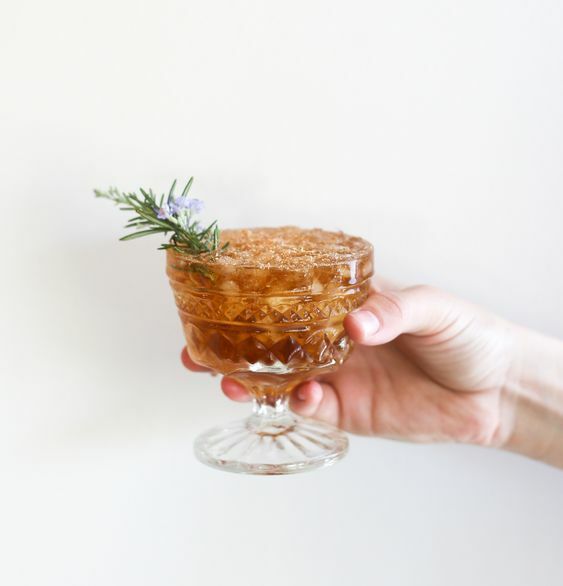 A fleeting love affair and a cocktail to remember it by. It is unmistakable, the scent of the lilac trees in full bloom, heavy like a damp wool blanket yet somehow as carefree as a light linen picnic cloth you just can't get to settle down as the spring winds keep taking it from you. When you have lilacs nearby they fill not just your nose with their heady sweet floral scent, but your head and your heart too. somewhat unsettling how they are such a delicate soft flower and still overpower. To me the scent of lilac is my childhood, if it could be bottled up and stored away for times when I am desperate for it I would. But this magic, this memory is not for bottling. It is simply my sweet love affair which comes to remind me that time doesn't last. Summer will be upon us, hot and heavy, the colors of spring turning green green green. Autumn will arrive, a dissonance of relief from the heat but sorrow for another school year beginning with freedom and play turning to schedules and school desks. Winter is glorious in it's first snowfall- warm nights by the fire, a cold wind through bare trees so hard to imagine soon to be filled with the sweet little lilac blossoms of another cycle. Another fleeting love affair with remembering. Another few weeks to fill my lungs with the unmistakable scent of childhood, of growing up among the lilacs. I can however drink it. Go gather your lilac blossoms! There is always something new to discover on Etsy. Here are a few you should check out. Click on the text to visit their shop. Chocolate. Honey. Pollen. WILD OMEN. Mountains. always. Dainty jewelry for the free spirit. Rack it. FIXA. We are Chrome. This weeks 5 favorite WILD crafted finds on Etsy. Today I wanted to share a few of my favorite (nature inspired) finds on Etsy. I hope it inspires you to think a bit about the importance of handcrafted goods. Think before you run to the big stores and trade your hard earned money for things void of love and craft. Dig for something better. with open heart; await occasions, hurry never... this is my symphony." Click on text below each image to be taken to each of the Etsy shop links for browsing! American Wilderness Belt Buckle by December Moon Design. It is cold here in New Hampshire and there really are not too many things I like to put in my belly more than fine chocolate you can drink. I admit to be quite picky when it comes to chocolate, and even more so when it's served in liquid form, in a mug, topped with whipped cream and marshmallows. Cocoa puts me in my happy place. So, why not have a little fun trying a few variations... you can even call it healthy! Go toss that Swiss Miss watered down powered stuff, or at least save it for those folks who just don't "get" good cocoa. Enjoy! This Hot Cocoa recipe is from a wonderful blog called The Sprouting Seed. Here the chocolate is straight up cacao rather than the cocoa we usually use (which is stripped of basically everything that we can consider good for us). Warm milk in a saucepan on the stove at medium-low heat until milk is thoroughly heated. Add cacao, honey, cinnamon, a pinch of cayenne and a pinch of sea salt and whisk until smooth, then remove from heat. Pour hot chocolate into your favorite mugs and add homemade marshmallows on top. Sprinkle with a pinch of cacao and add a cinnamon stick for garnish. you can buy it HERE if you can't find it locally. Maca Hot Chocolate: maca what? Spanish conquistadors recorded in their journals that when they arrived at the puna of Junin in Peru, the babies were well-fed and adults were tall, attributing these characteristics to the diet of maca. The Quechua Indians in the central highlands of Peru continue to consider maca a highly nutritious food with a range of physical benefits and they include it as a regular staple in their diet. Navitas Naturals Maca Powder is loaded with nutritious vitamins, minerals, amino acids and plant sterols, including vitamins B1, B2, B, C, D, E, iron, potassium, copper, magnesium, selenium, phosphorous and calcium. It's a fiber-rich food and a good source of plant protein (about ten percent). Maca root is also a source of fatty acids, and it contains four unique alkaloids (Macaina 1, 2, 3 and 4). This is the recipe from Mind Body Green. Carefully heat your almond milk to a simmer. Then blend it for a few seconds with your maca and cacao powders. Pour the liquid into your favorite mug and sprinkle some cacao nibs and cinnamon on top. Enjoy! Ahhh, coconut and dark chocolate. This one is so simple and closest to my quick cocoa fix. I have been using hemp milk as this recipe calls for coconut milk. Preparation time PREP: 5 min. Cooking time COOK: 10 min. Head on over to Paleo Leap by clicking HERE, they share some great variations such as Peppermint Hot cocoa. Then browse around for some other fantastic recipes. For the pinners, HOT CHOCOLATE(marshmallows, whipped creams, chai and more) BOARD is linked here. The older it is, the better it is- vintage cast iron is smoother. Your modern cast iron will never be quite as non-stick as the vintage stuff. The material may be the same, but the production methods have changed. In the old days, cast iron pans were produced by casting in sand-based molds, then polishing the resulting pebbly surfaces until smooth. Vintage cast iron tends to have a satiny smooth finish. By the 1950s, as production scaled up and was streamlined, this final polishing step was dropped from the process. The result? Modern cast iron retains that pebble texture. No big deal but it may encourage you to find some old cast iron the next time you drive past a yard sale or antique shop. Maybe you can get your hands on some old family cast iron pieces- so many stories in a great grandma's skillet. They are inexpensive: especially compared to the amount of money you can throw down buying fancy french saute pans such as a Mauviel M'Heritage 2.5mm 11-3/4 inch Copper Fry Pan for nearly $500. Take a look here at The Lodge website to see all the options in cast iron cookware. The first one you would probably want to own is the standard skillet. Size would depend on how many you tend to cook for, but keep in mind how great these are for finishing a whole meal in one pan. I try to avoid cleaning dishes so I go big with the 12 inch which you can pick up new for $37. It is a perfect size to saute swiss chard & red onions in one side and bacon or sausage in another, all while keeping the other third of the skillet for eggs sunny side up. A well seasoned cast iron skillet is virtually non-stick, allowing you to cook with little or no oil. They are not as hard to season and care for as you think. To season or cure it means filling the pores and voids in the metal with grease of some sort, which subsequently gets cooked in. This provides a non-stick surface on the inside of the cast iron pan. Traditional cast-iron skillets don't emerge from the box with a nonstick surface. Coat the skillet with cooking oil and bake it in a 350° F oven for an hour. It won't take on that shiny black patina just yet, but once you dry it with paper towels, it will be ready to use. Less is more. Don't feel as though you have enough storage space for all your cookware? You can probably clear out half of your pot and pan collection right now and replace it with one 12 inch cast iron skillet and a lid. Seriously! With it you can sear a darn good steak, bake cornbread, sunny up your eggs, roast a chicken, bake bread...the things you can do with your skillet are nearly endless. Cast iron is tough, it can take a beating. Go ahead, set it right in that campfire or into your hottest oven. Just don't leave it sitting in water or forget it in the river. No different than your favorite pair of boots or jeans, they get better the more you use them. It finally feels like winter again! It was a chilly 51 deg F in the kitchen this morning and as I got the wood fire stove burning hot again my thoughts were on soup. The sort of warm you from the inside, wrap your hands around it beautiful fuel for the day. Pick a few and get cooking, store leftovers in your freezer for later in the week when you have hungry bellies to feed and and a cold wind blowing outside. Recipe link from A Beautiful Mess. If you want to whip this up in a flash during the week when you don’t have a lot of time for dinner, and the troops are harassing you to make something delicious right away, make this soup. Some help from the store can have this soup on the table in 30 minutes. Use low-sodium store bought chicken stock or broth. Buy the kale in the pre-washed, pre-cut sacks that are ready to go. If you are not a fan of pork sausage, a spicy Italian chicken sausage does the same trick. No one will know, and your family will love you for it. Hope these inspire you to get cooking and fuel up for some time outdoors, or warm up after when you come inside. Don't forget to take advantage of having some ready made lunches to bring to work or an easy dinner for those nights your family is on the run. Looking for some good travel containers? Check this out-.don't spill your soup. I also hope you take a little time to browse these 4 fantastic food blogs and they inspire you to try something new. Love to hear what you cooked up and always feel free to share your own favorites! Keep that cast iron well seasoned, next I will share why cast iron is my favorite and how to keep yours in its best cooking shape. Eat well and go outside- Hx.